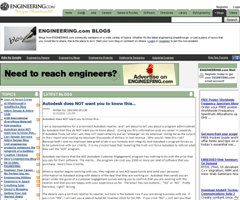 Earlier today, I came across a rather interesting blog post by an anonymous author titled “Autodesk does NOT want you to know this…” The post claims Autodesk employs a variable pricing model that if you are not careful could cost you $500. According to the post, the variable pricing model falls under the umbrella of the ACE (Autodesk Customer Engagement) program. ACE really seems like a centralized sales lead database for Autodesk & its many resellers. When you begin working with a reseller, they will enter your information into ACE as a new opportunity. Once they do that, Autodesk sends you an e-mail containing a simple Yes/No survey on your experiences so far. On the surface, such an e-mail seems rather innocent, but the post alleges this survey as the trigger for the variable pricing model. The post states a seat of AutoCAD Inventor 2010 is $4,795 if you answer “Yes” or $5,295 if you answer “No” ($500 difference). Under this pretense, you are essentially paying $500 more for bad service, as the reseller gets the same profit margin regardless! Personally, that does not make a lot of sense to me. 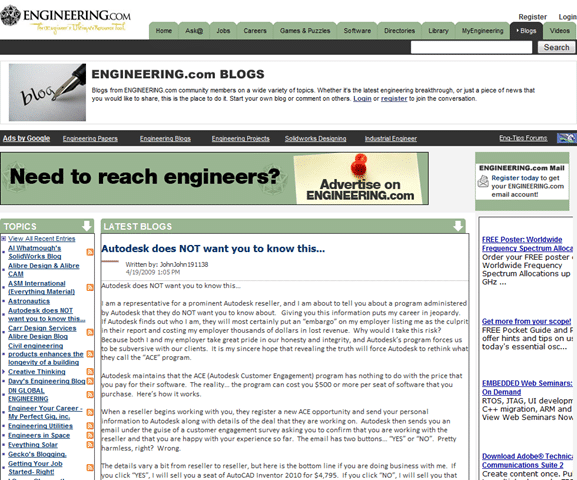 Seeing that I work for neither Autodesk, nor a reseller, I really do not know if this post is fact or fiction. Additionally, its certainly possible that Autodesk uses backend incentives for their resellers, as I know such incentives are common in sales. For instance, car salesman usually receive part of their commission from the dealership, and another part from the manufacturer. If this $500 is a backend incentive, and it helps ensure I get great service from my reseller – I’m all for it! Do a good job; you get an extra incentive when you close the deal; do a bad job and you lose the incentive. Seems fair – right? In other words, if you answer “Yes” the reseller (not you) gets a $500 backend incentive for doing a good job. On the other hand, if you answer “No” because the reseller is not doing a good job, they would get nothing (in the way of backend incentives). That seems like a more logical sales model to me. After all, I have a hard time believing Autodesk punishes the customer for receiving bad service from a reseller. You can read the full post to develop your own opinion on the alleged variable price model of Autodesk. Have you had any experience with this model? Speak out in the comments of this post! I am kind of thinking they must be thinking people will get a second quote from a different re-seller and then get a second survey regarding that re-seller. If they give that re-seller a favorable rating, then they will get that quote and it will obviously beat the first re-seller and the customer will end up going with the re-seller who they liked best. However, I have a feeling most people assume the price is the same everywhere they go. However, I noticed someone did mention in the comments on that post that this policy only applies to full license purchases and not subscription purchases.